I’ve been told that one of the secrets to successful networking is to show that you are vulnerable. If you don’t let people know that you need their help and ask for it, you’ll never get anywhere. I recently made the brave decision to become a freelancer. So, I’ve spent the past few weeks contacting people that I’ve previously worked with to find out how I can help them with their business and/or find out if they know anyone else who I might want to speak with? My goal is to talk to anyone who will listen and who might want to give me some advice. So far, I’ve been overwhelmed by the amount of people who have offered to help by either sitting down to talk over coffee or by introducing me to someone else who might be a great contact. People truly do want to help you if you give them the chance. As a result, I have met some very interesting and inspiring people and I feel extremely grateful to all of them. I used to shy away from networking because I was afraid of making a fool of myself but now my mantra is “always be networking”. What do you have to lose? You just never know who you might meet and everyone has a great story to tell. You might even make some new friends along the way. 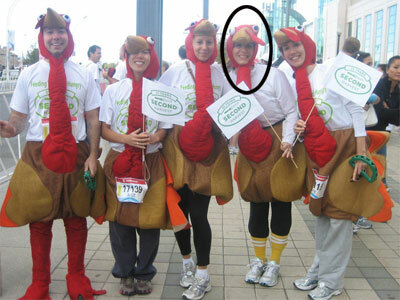 I figure, if I can dress up in a turkey costume and run 5K in front of thousands of people, I can definitely call someone up and ask them to go for coffee and chat. This week, I am staying open to all possibilities!